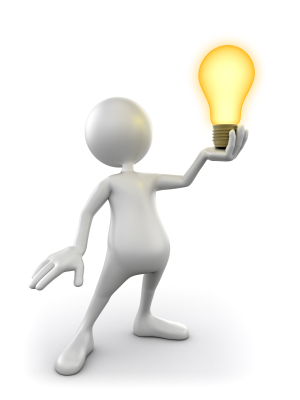 These stock ideas presented here are just that, ideas. You are responsible for the trades you make as you can lose some or all of your money. You must do your due diligence and research any stock before buying. You need to understand the risks involved before any purchase. We are not investment advisors, please consult your investment advisor before making any investment. Stock may go up in value or may go down in value. No one can predict what the stock market will do, or individual stocks. Let look at some stocks that have good technical patterns. If you are interested in what the stock market is doing go to the Stock Market Dashboard. 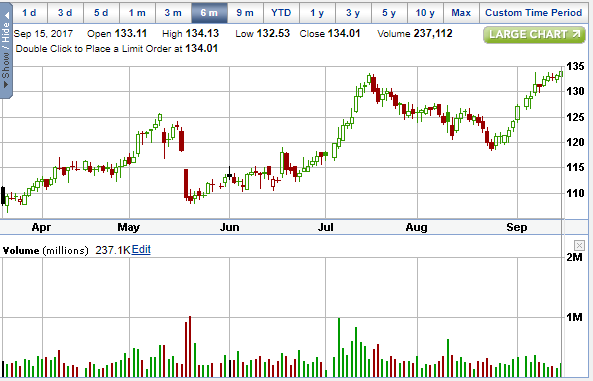 The following stock ideas are based mainly on strong chart patterns and may include a fundamental indicator. One re-occurring pattern that exists is that when a stock is breaking out it seems that shortly after the breakout (i.e. the next day or a few days later), many stocks will pull back. Rather than buying on the break out, it may be wise to wait for the following pullback to buy. We are not investment advisors, you must do your due diligence before investing in any stock. This company is General Motors. GM is in the Automobile business. 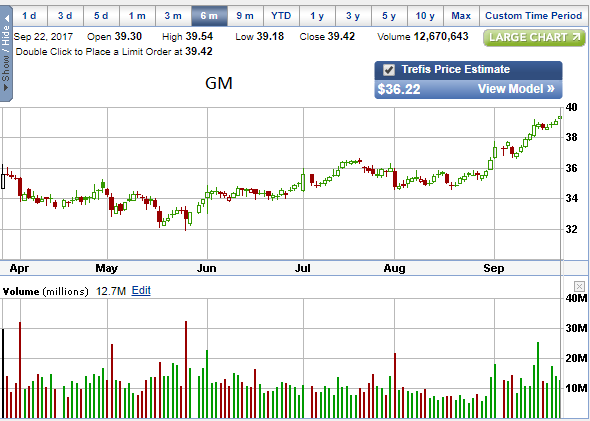 GM pays a dividend of 3.86%. GM earns $6.30 per share. This is just an idea, you will need to research it further to see if it meets you investing objectives or check with your investment advisor. This company is COPA Holdings. COPA is in the Airline business. CPA pays a dividend of 2.24%. CPA earns $7.76 per share. This is just an idea, you will need to research it further to see if it meets you investing objectives or check with your investment advisor. This company is Gilead Sciences Inc. GILD is in the Biotechnology business. 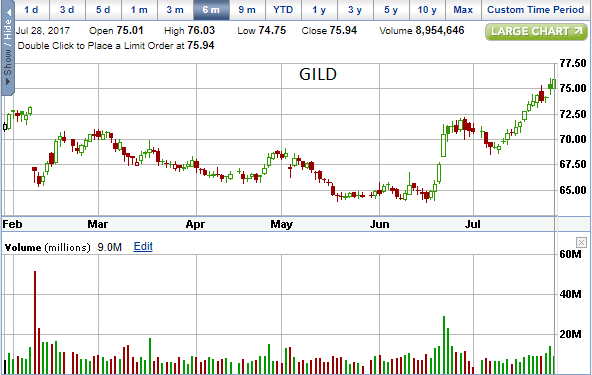 GILD pays a dividend of 2.77%. GILD earns $9.21 per share. This is just an idea, you will need to research it further to see if it meets you investing objectives or check with your investment advisor. This company is Sun Life Financial Inc. SLF is in the Insurance business. SLF pays a dividend of 3.5%. SLF earns $3.18 per share. This is just an idea, you will need to research it further to see if it meets you investing objectives or check with your investment advisor. This company is Tesoro Corp. TSO is in the Oil, Gas and consumable fuels business. 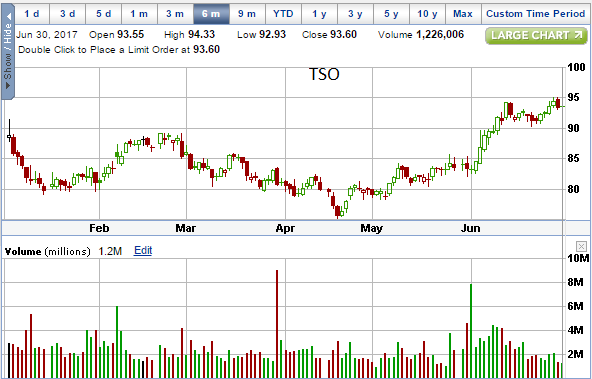 TSO pays a dividend of 2.36%. TSO earns $5.97 per share. This is just an idea, you will need to research it further to see if it meets you investing objectives or check with your investment advisor. 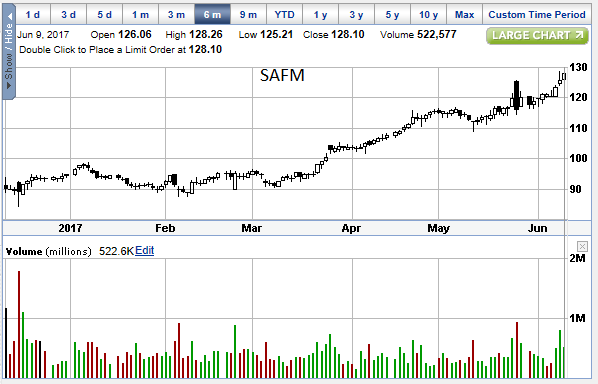 This company is Sanderson Farms Inc. SAFM is in the Food Products business. SAFM pays a dividend of 0.76%. SAFM earns $9.74 per share. This is just an idea, you will need to research it further to see if it meets you investing objectives or check with your investment advisor. This company is Lam Research Corp. LRCX is in the Semiconductor business. 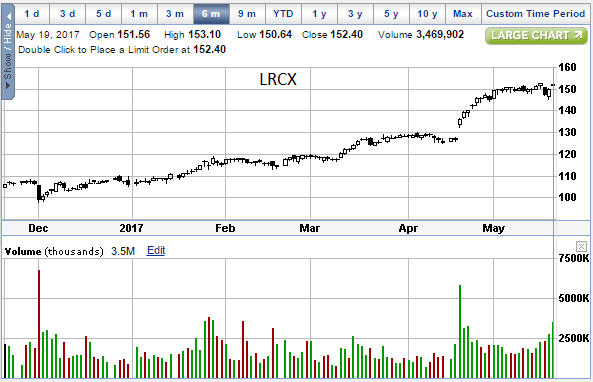 LRCX pays a dividend of 1.20%. LRCX earns $7.84 per share. This is just an idea, you will need to research it further to see if it meets you investing objectives or check with your investment advisor. This company is XCEL Energy. 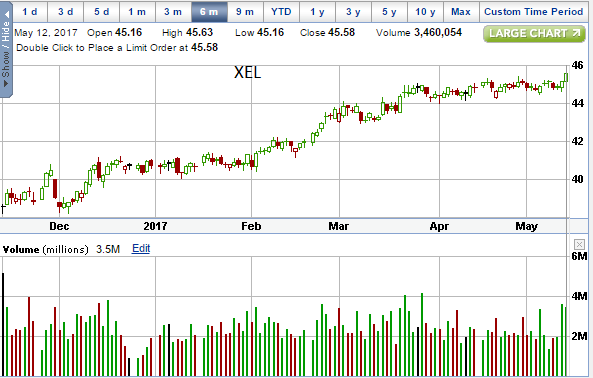 XEL is in the Energy business. XEL pays a dividend of 3.19%. XEL earns $2.20 per share. This is just an idea, you will need to research it further to see if it meets you investing objectives or check with your investment advisor. This company is Stanley Black and Decker. SWK is in the Machinery business. 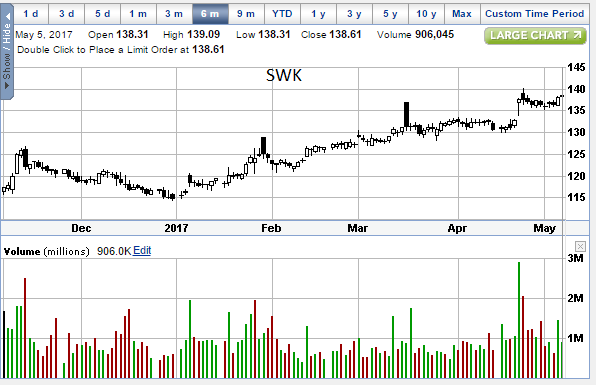 SWK pays a dividend of 1.68%. SWK earns $7.82 per share. This is just an idea, you will need to research it further to see if it meets you investing objectives or check with your investment advisor. This company is Best Buy. BBY is in the Specialty Retail business. BBY pays a dividend of 2.69%. BBY earns $3.75 per share. This is just an idea, you will need to research it further to see if it meets you investing objectives or check with your investment advisor. This company is Apollo Global Management. APO is in the Capital Markets business. APO pays a dividend of 5.54%. KLAC earns $2.10 per share. This is just an idea, you will need to research it further to see if it meets you investing objectives or check with your investment advisor. This company is KLA-Tencor Corp. KLAC is in the Semiconductor business. 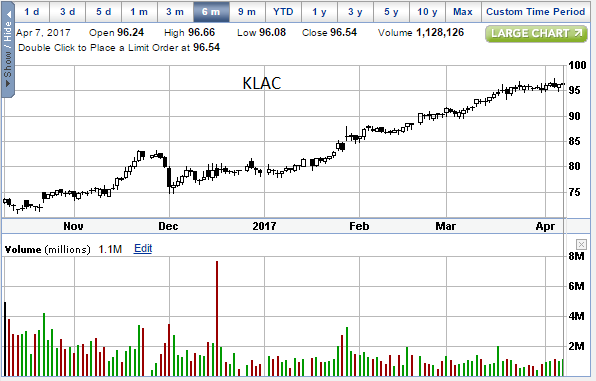 KLAC pays a dividend of 2.25%. KLAC earns $5.50 per share. This is just an idea, you will need to research it further to see if it meets you investing objectives or check with your investment advisor. This company is Darden Resturants Inc. DRI is in the Hotel, Restaurant and Leisure business. 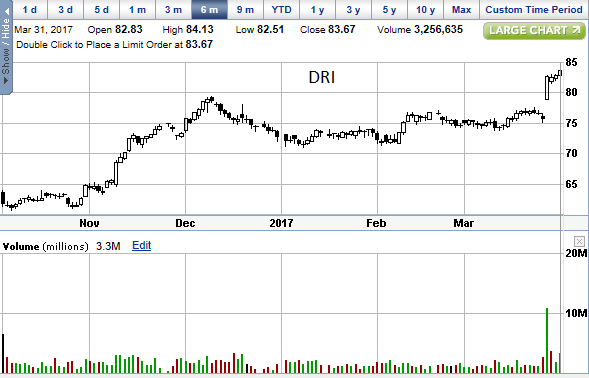 DRI pays a dividend of 2.68%. CCL earns $3.92 per share. This is just an idea, you will need to research it further to see if it meets you investing objectives or check with your investment advisor. This company is Carnival Corp. CCL is in the Hotel Restaurant and Leisure business. CCL pays a dividend of 2.39%. 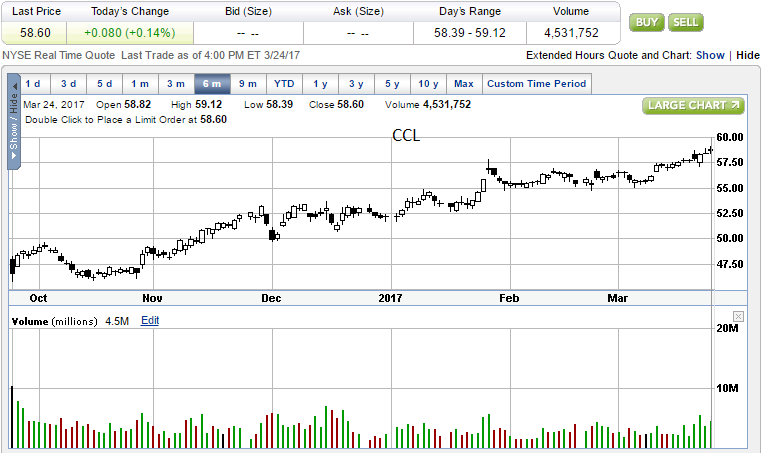 CCL earns $3.75 per share. This is just an idea, you will need to research it further to see if it meets you investing objectives or check with your investment advisor. This company is Home Depot. HD is in the specialty retail business. HD pays a dividend of 2.39%. HD earns $6.45 per share. This is just an idea, you will need to research it further to see if it meets you investing objectives or check with your investment advisor. If you are interested in what bonds are doing go to the Bond Yield Dashboard. If you are interested in REITs go to REITs explained. If you are interested in day trading, this site is recommended The Technical Trader. For other swing trading ideas (i.e. 2 weeks, 2 months and longer) check out the wizard. If you landed on this page by accident and you were looking for some real Booyah click here for Cramer.